If you're looking for all the amenities of home, oceanfront views, a clean and well maintained condo at a fair and reasonable price then you've found it! Maalaea Banyans is exclusively located in a quaint harbor village nestled between Maalaea Bay and the majestic West Maui Mountains. Enjoy the luxury of being miles from crowded high rise resorts yet convenient to all the preferred island activities. Spectacular oceanfront views of Maalaea Bay can be seen from the privacy of your own spacious lanai. Just steps to the ocean you'll enjoy being lulled to sleep by the sounds of the surf and the palm leaves swaying in our cool tropical breezes. You can walk to the Maui Ocean Center home of Maui's world class Aquarium along with a delightful outdoor shopping mall that features an array of great boutique shops and some of the best island dining. Of course if you're interested in any of the many water sport activities the Maalaea Yacht Marina is right there next to the Maui Ocean Center. Take advantage of the many sunset catamaran excursions or visit one of our neighbor islands for some of the best snorkel and diving experiences on Maui. You can also walk to the Maui Water Park that features water bumper boat rides, miniature golf, a rock climbing challenge and the equally challenging Extreme Trampoline..fun for the whole family! The Maalaea Banyans is located along the Maalaea Bay considered one of the premiere locations for whale watching. The property features an oceanfront swimming pool, Jacuzzi and a prime oceanfront picnic area equipped with gas barbecue grills. You can enter the water directly in front of Maalaea Banyans, but you'll probably want take a quick 3 min stroll to one of the most fabulous white sandy beaches at the end of our street. Our unit is located on the top floor with incredible unobstructed oceanfront views! We visit our Maui home often so we tend to keep our unit feeling very homey and comfortable with all the amenities we're accustom to having at home. We have air conditioning, ceiling fans, a fully equipped kitchen with disposal and washer and dryer for added convenience. Cable TV and DVD player available in our living room. We keep our kitchen well stocked for those of you who enjoy cooking and have plenty of extra linens. We have an on island managing agent available for any assistance you may need throughout your stay. We hope you visit soon and often! There is a small sandy little cove that provides direct access into the ocean fronting our property. Cozy condo with well-stocked kitchen. The condo is a bit dated but has been well cared for. Only suggestion would be to consider new beds and bedding. The condo grounds were in excellent shape and the pool is very nice. We loved the central location for excursions to Kihea/Wailaea or Lahaina and West Maui. Also, we liked being able to walk on the 3-mile long undeveloped beach that extended from the end of our road to the north end of Kihei. Another bonus was being able to walk to the marina to catch boats for whale watching and snorkel tours (we went with the Pacific Whale Foundation). Equally convenient were the several bars/restaurants at the Maalaea Harbor- nice not to have to drive to eat and drink. We would return. Thank you for your kind review. We're glad to hear our condo was cozy, worked out well for you, and that you'd return again. This indeed might be the best location on island with all there is to do nearby. We will take a look at the beds and bedding to see if they need replaced. Thanks for bringing that to our attention. We appreciate you being our guest. Please do return again soon. Mahalo! Nice place with lots of room. Each nite, up to a dozen turtles come to the shore right outside. Awesome! It's an amazing sight to see the turtles feed, and they get up so close to the shoreline. Thanks for your kind review, Doug. We're so glad you had such a great stay. Please do return again soon. Mahalo! Great location. Quiet street. Turtles below the lanai! Great location! Outstanding view with turtles below. Lots of towels. The grill allowed us to eat in. Private washer/dryer a real plus. Thanks for the kind review, Trish. You were so lucky to see the turtles right out back like that. We appreciate you being our guest. Please do visit again. Mahalo! Great condo centrally located.Plenty of room, well stocked. Great view. Several sea turtles. Nice grill area. Pool and hot tub were nice. Beach at end of road stretches for miles, really nice. Would definitely stay here again. Thanks for the glowing review, Douglas. You really hit on some of the unique aspects of the condo and property, especially being so centrally located. We appreciate you being our guest, and hope you do make good on staying with us again. Mahalo! Great condo. This place has it all. It was very comfortable for my family, clean, and had all the amenities needed to enjoy Maui. The central location was great and the ability to walk to the harbor for excursions to Molokini and Coral Gardens was a bonus. Sitting on the lanai and by the beach to watch the sunrise and whales breaching was fantastic. The entire unit was very quiet in the evening. I would recommend to families, couples, and those visiting staying with friends. 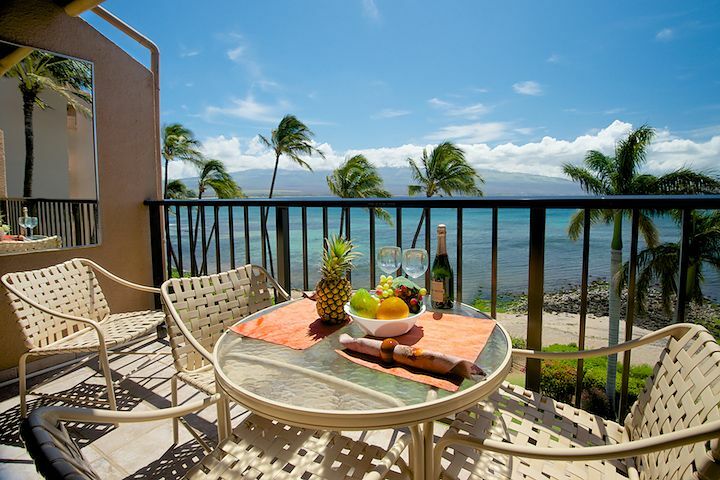 Maui Beach Front Rentals was very easy to work with and very professional. We really appreciate your kind review, Todd, and are so glad you had such a great stay during your vacation. It was our pleasure having you as a guest and we hope you do consider a return again soon. Mahalo! Thank you for your review. We're truly sorry for your loss, and if we were curt or showing a lack of empathy when you called in. Our representative was attempting to explain why we can't refund in full on such a short notice, and that we do offer travel insurance to avoid just these type of situations, which you did reject. We have to be responsible to our owner's, who we manage this property for, and their policy is not to allow us to do this type of refund right on the eve of guest's arrival. It sounds like we could have been nicer in providing you this information. We're very sorry, and do hope you consider returning. Thank you for being our guest. Maalaea Banyans is located in a quaint fishing village ideally located half way between all the best Maui island attractions. Within walking distance to Maui's first class Aquarium and Ocean Center where you'll find a variety of excellent dining, boutique shopping, live entertainment and all the water sport activities on Maui.